Abergavenny TownAbergavenny is located in the heart of the Welsh Marches on the southern edge of the Brecon Beacons National Park. This ancient and welcoming town is the ideal centre for a truly wonderful, refreshing holiday, whether it be a short break at any time of the year or a longer leisurely stay. Abergavenny is a great place to stay when exploring all that the Brecon Beacons and the Black Mountains have to offer, from some of the best hill walks in the world, to horse riding, mountain biking, adventure weekends and gliding. Offa's Dyke and the Marches Way also pass by the town, whilst the Forest of Dean is only a short drive away. The town itself, caressed by the Brecon Beacons and Black Mountains and nestling in the famous Usk Valley, is full of historic, architectural, cultural and scenic interest, proud of its past and its traditions. Since the 12th century, Abergavenny has a proud of a history that takes in the infamous Norman Marcher Lords, the Glyndwr Uprising and the Civil War. This tumultuous past is etched into the ruins of Abergavenny Castle and chronicled in the local museum. The jewel in Abergavenny's crown is the Abergavenny Food Festival in September attracting top chefs and food critics; the Festival reflects the local produce with a reputation as some of the most sought after and fashionable ingredients in the world. If your visit doesn't coincide with the Festival however, the shops, monthly farmers market and many of the towns restaurants will give you the opportunity to savour Abergavenny's finest food. For those interested in the industrial history of the region, the nearby town of Blaenavon is a World Heritage Site with a number of museums and interactive experiences. Abergavenny castle was built in 1075 as a Norman stronghold in the contested territories around Offa's Dyke. Exactly 100 years later it was the site of a massacre as William de Braose decided to seek retribution on local chieftains by summoning them to the castle on Christmas Day and then brutally slaughtering them. During WWII Rudolf Hess, Hitler's deputy, was held at Abergavenny Hospital where he spent time making paintings of the surrounding countryside. 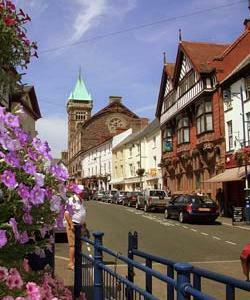 Abergavenny is located in the heart of the Welsh Marches on the southern edge of the Brecon Beacons National Park. This ancient and welcoming town is the ideal centre for a truly wonderful, refreshing holiday, whether it be a short break at any time of the year or a longer leisurely stay. The Tourist Information Centre is located at the Bus Terminal in the town centre. Abergavenny has a railway station on the South to North Wales route between Newport and Shrewsbury. By Train: Abergavenny Train Station offer cycle storage for 5 cycles and a taxi rank is located outside the station.